The Aesthete's Lament has a post about the eclectic designer, Paul Iribe, which is well-worth reading. Blue-eyed and blonde-haired, young Prince Albert Edward impressed everyone with his sweet nature, except his parents. Queen Victoria and her consort, Prince Albert, were disappointed in the young Prince because they didn’t think that he was as clever as their favourite, his elder sister, Princess Vicky. They subjected the little boy to a vigorous and strict school-room regime and kept him away from other boys in case he was exposed to bad influences. The young Prince lacked playmates and was teased rather mercilessly by his elder sister. It was no wonder that he was given to frequent rages and his parents found him hard to control. Edward also preferred outdoor pursuits, such as shooting and riding to his studies. He was not one for reading but this didn’t affect his capacity to work when he became King. Queen Victoria, eventually realised that she’d underestimated her son but this took many years. Edward studied at the universities of Oxford and Edinburgh but his parents were not pleased with his progress. They thought that he spent too much time enjoying hunting and rich food instead of concentrating on his work. They were to be even more disappointed in him. When the young Prince trained with the Grenadier Guards his fellow officers discovered his lack of experience with women. They sneaked the pretty actress, Nellie Clifden, into his room to surprise him. Edward was delighted with Nellie and she became his mistress. The problem was that Nellie began boasting about the affair. Queen Victoria and Albert were outraged. It was not only his lack of morals that caused them concern. Princess Vicky had found a good match for Edward – the Danish Princess Alexandra. His parents were worried that his affair could affect the planned romance. Prince Albert died of typhoid shortly after the affair. The Queen was so upset that she blamed Edward for causing his death. It would take some time before she forgave him. Luckily Princess Alexandra was still available. The Prince had met her before but he wasn’t that impressed because he preferred Nelly. After his father’s death he felt very contrite and he thought about the beautiful Danish Princess more and more. Queen Victoria was very impressed with the young woman and the Prince eventually proposed. The young couple were in love and the Queen thought that their marriage would be happy. Princess Alexandra soon became disillusioned with her husband, however. Her deafness tended to isolate her and probably annoyed Edward. She also had a succession of pregnancies and Edward started mixing with a fast set who liked shooting, hunting and women. He became involved in many scandals, which annoyed Queen Victoria and his wife. This included the Mordaunt scandal in which Edward was accused of being the father of Lady Harriet Mordaunt’s child. Many of his letters to her were read in court. These were quite innocent but Edward also denied any impropriety. Lady Harriet was declared insane shortly afterwards. Edward’s many mistresses included the beautiful actress, .Lily Langtry and Daisy Brooke. He also had a long affair with Alice Keppel. What do you think of these shoes: Edwardian Style Zanotti Shoes? They're much too high for me and look fairly dangerous anyway! I wish that this fashion for very high-heeled shoes was over, actually. I agree that the style is quite Edwardian and attractive but I think that the shoes would still look good if they had lower heels. I hope to write a longer post on the weekend. Learn Math Easily at Tutor Vista! algebra tutoring in such basic algebra as the properties of addition and multiplication, and difficult concepts like linear equation and finding the roots of polynomials. Tutor Vista’s highly qualified and experienced tutors will also provide help with advanced algebra, such as polynomial functions and sequences. Students can communicate with their Online algebra tutor by chat, email or messaging, so they can easily learn from home. Tutor Vista's online algebra tutor also provides help with homework and exam prep. The interactive whiteboard which enables students to see what they are studying is also very useful and a big advantage. Tutorvista.com makes studying any type of maths easy. Students can study maths, such as Geometry and Calculus, easily over the Internet with the helpful tutors at Tutor Vista’s library, which includes Math question banks and Math animations provides useful information for students. Useful techniques for solving Math and algebra problems can be seen at Tutor Vista Math Answers. Some of the most difficult problems in Math are word problems. Tutor Vista’s experienced tutors help students learn how to solve Math word problems at any time night or day online. It is easy to study difficult algebra word problems with Tutor Vista's algebra tutoring. Tutor Vista also gives students useful tips for solving math-word-problems. If you are a student wanting help with Math or Algebra, what are you waiting for? Visit today. Cathleen ni Houlihan, one of the symbols of Irish nationhood, is often depicted in literature as an old woman who needs the help of young men to fight for Ireland. She is not usually as beautiful as Hazel Lavery appears on the old Irish pound note. Born Hazel Martyn in Chicago in 1880, she was the daughter of a wealthy American industrialist descended from an old Irish family. Hazel was a talented young artist and ambitious, but fate had other plans. The ‘most beautiful girl in the Mid-West’ fell in love with the Irish artist, John Lavery, on a family holiday in Brittany, when she was quite young. The widower was thirty years older and Hazel’s family was not impressed with the match. Hazel agreed to marry Ned Trudeau, a handsome surgeon, who was her family’s choice. Ned died of pneumonia a short time after they were married when Hazel was pregnant with Alice. Hazel wanted to return to John but her mother still opposed the idea. After her mother died Hazel was free. She married John in 1910. The Laverys were friendly with the Churchills. After the Dardanelles Campaign in 1915, Churchill’s wife, Clementine, thought that Winston would ‘die of grief.’ He had always wanted to paint and bought a paintbox and brushes. One day when he visited Hazel, she asked: “Why do you hesitate?” She persuaded him to finally start painting. Hazel and John also helped Winston Churchill by becoming involved in diplomacy. Hazel became extremely interested in Irish nationalism – she even described herself as Irish and put on an Irish accent. She and John offered their house in South Kensington, London, as the site for the negotiations for the Anglo-Irish Treaty in 1922 which formed the basis for the Irish Free State. Legend has it that forty year old Hazel fell for the handsome Irish nationalist, Michael Collins, and that they had an affair. She and John apparently had a rocky marriage. Michael wrote poems about her ‘delicate sad grace.’ However, Michael Collins was engaged to a young lady and Hazel was twenty years older and dyed her hair, according to one of Churchill’s daughters. There are claims that Hazel would have been shot by the I.R.A. if they’d had an affair. There are also stories that Hazel wanted to put on widow’s weeds after Collins was shot and even throw herself onto his grave, but this is probably an exaggeration. It’s a pity that Hazel’s talent for painting has largely been unnoticed. Perhaps her husband was the more talented of the two. Hazel died in 1935 and is buried with John in Putney Vale Cemetery. Here is a site with beautiful photos and excellent descriptions of costumes from historical films: Fashion in Films at Winterthur. There are also audio-clips about the designs. I listened to one but I found it very short and disappointing. Paul Iribe was a famous fashion illustrator, designer and graphic artist. He was one of the founders of the art deco movement. Born in 1883 in Angeloume, Iribe studied at the prestigious Ecole des Beaux-Arts and the College Rollin. He became an apprentice printer at the newspaper, Le Temps. 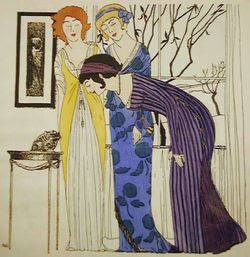 In 1908 the great fashion designer, Paul Poiret, 'discovered' Iribe. He admired Iribe's use of the pochoir technique, which involved colours brushed onto paper by using stencils. The technique featured bright colours and simple, sharp lines. Iribe produced Les Robes des Poiret to advertise Poiret's new fashions. Only 250 were printed and each were signed and numbered. This was a great advance in fashion illustration because of the pochoir technique and the very modern poses of the models. They didn't just stand in unnatural poses. These models talked, played the piano, and generally enjoyed life in relaxed arrangements. Iribe also designed wallpaper, fabrics, furniture, and helped Chanel with her jewellery designs. He went to Hollywood in 1914 where he designed costumes and interiors for Paramount studios. His designs were used in many of Cecil B.DeMille's epics, including The Ten Commandments. Iribe eventually returned to France where he continued his design work and set up a political newspaper. 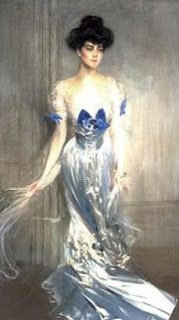 Chanel fell for the wonderfully talented fashion illustrator and caused him to separate from his second wife, Marybelle Hogan, an American heiress. He and Chanel were engaged when he died of a heart attack while playing tennis. Coco Chanel was devastated. I hope to write a longer post soon. As you've probably guessed by now I have a special interest in the Vanderbilts. It's not for any particular reason - I just find The Gilded Age and the famous, wealthy families of that era fascinating. Virginia was the sister of Tessie Oelrichs and followed in her footsteps. The sister's father made a fortune from the Comstock Lode and Bonanza Mines in Nevada. He was also a US Senator from 1881 -1887. Virginia, nicknamed 'Birdie', looks like a raven-haired beauty in her portrait, but she was described by The New York Times as 'not exactly a great belle'! A devout Roman Catholic, she once wanted to be a nun, but the attractions of the social life in New York and Newport were too great a temptation. Virginia stayed with her married sister, became popular, and enjoyed many sports. 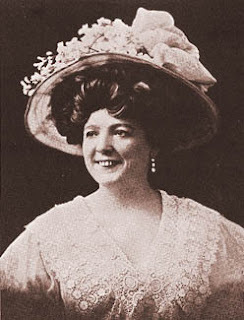 She had lots of suitors, including H. Maitland Kersey and Bourke Cochran. She married William K.Vanderbilt in 1899 in a Roman Catholic wedding. He inherited a large fortune and worked as the president of the New York Central Railroad Company. He was the brother of Consuelo, the Duchess of Marlborough. The marriage only lasted ten years. Virginia started a thoroughbred racing stable and set up the Virginia Fair Legacy Fund to rebuild a Catholic school in San Francisco after the earthquake. In 1930 Virginia hired John Russell Pope to design a French classic limestone house. This is now owned by the antique dealer Carlton Hobbs. Soon after this her son William K. Vanderbilt III was killed in a car accident in Newport. Virginia had also had to endure the death of her brother, Charles, in a car accident. She died shortly after her son, aged only 55. The Advanced Direct Security Company provides inexpensive Home Security Systems which are easy to use. This company's history dates back to 1874 and it has been creating innovations in home security since then. The Advanced Direct Security Company provides the best home security surveillance system which will protect your home for 24 hours a day 7 days a week from one of the company's 4 interconnected monitoring centers. The Advanced Direct Security Company's home security surveillance system is the best way to protect your home. La Belle Epoque is one of my favourite websites about this enchanting era which was full of innovations in the arts and architecture. As well as gorgeous photos, there are articles about Art Nouveau artists and the origins of advertising and cinema. This is one of my favourite photos on the site Morlaix in Brittany . Theresa Oelrichs once asked the Great White Fleet of the American Navy to bring their ships to her party to add interest to the view from her house, Rosecliff, in Newport. When they refused she used props instead. Her 'Bal Blanc' party was, nevertheless, a great success. She filled her beautiful house, Rosecliff, with white flowers, including lilies and orchids, and bought white swans for the fountain. The women all wore white dresses. 'Tessie' was born Theresa Alice Fair in Virginia City, Nevada. Her family was poor until her Irish father, a prospector became wealthy because of the Cornstock Lode. This was the largest single deposit of silver and gold ever found. Her parents divorced and her mother gained custody of Tessie, Virginia and Charles. Her father had custody of another son, James. Sadly, James eventually committed suicide. Tessie's father became a Senator but he was never accepted into 'Society'. Raised in San Francisco, ambitious Tessie soon wanted 'better things'. She met the extremely wealthy Hermann Oelrichs in 1889 at a tennis match in Newport. He was almost 40 and never married. She was much younger. Although his parents probably wanted a better match for their son they gave the couple one million dollars as a wedding present. Tessie became one of the leaders of New York society, together with Mrs.Astor and Mrs. Ava Vanderbilt. These three were incredibly powerful and decided who would be accepted into the 'Four Hundred'. They also tried to outdo each other and other wealthy families with their wonderful houses and parties. 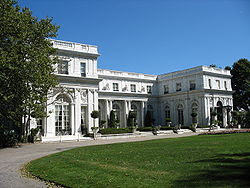 Theresa and Hermann commissioned the famous architect, Stanford White, to build Rosecliff which was modelled on the Grand Trianon in Versailles. It cost two and a half million dollars to build. Here she held her famous parties. A ballet, an opera and a circus were also held at the 'Gilded Age' mansion. Sadly, the house with its 22 master-bedrooms and hand-decorated, gilded ballroom was sold for a very low price in 1941. It is now a museum in Newport, Rhode Island and it has featured in many films, including the stunning The Great Gatsby with Robert Redford. I wonder whether I'll ever see it. 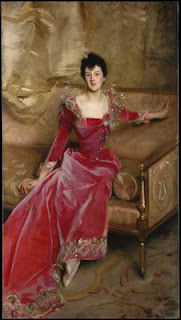 The Sargent portraits were quite amazing. They must have involved so much work and time! I especially liked this portrait of Mrs. Hugh Hammersley, a wealthy banker's wife. It's such a strong portrait but her beautiful dress is so delicately painted. Abelard has an excellent introduction to this era in France. This includes information on Art Nouveau, fashion, and the historical background. I have only skimmed this so far but I'm going to read it properly soon! I will also read the pages about French umbrellas. I like pretty umbrellas so I just bought an attractive one which was included as a gift with perfume. Recently investors have flocked to gold. This is because gold is the ultimate asset which provides safety and security. Gold will always hold its value and investors realise this, especially when the economy is volatile. Gold Coins Gain is an excellent site where you can buy gold. You can buy gold coins here, inlcuding the Liberty Quarter Eagle. There are many gold coins available. You can also buy gold bullion at the site. This is a well-designed and interesting site for investors who want to buy gold. Belle Epoque Europe is a pretty site which has information about artists, authors, paintings and events in the 'Gilded Age'. Unfortunately, I haven't been able to explore this site thoroughly yet but I am certainly looking forward to it! Beautiful nineteen-year old Consuelo Vanderbilt, granddaughter of the great Cornelius, could hardly stop crying on her wedding day. She was in love with Winthrop Rutherford, but her mother had made her marry the Duke of Marlborough. This meant that she'd have to leave her own country and live with someone she hardly knew and didn't find impressive. She found success as a Duchess and grew to love England, but not her husband! She visited Russia and dined with the Tsar himself at the Bal des Palmiers. Although Princess Alexandra's Faberge collection didn't impress her very much, she must have liked Grand Duchess Vladimir's and the Dowager Empress's collections. The former Empress's collection included a Blue Serpent Clock Egg. Soon afterwards the Duchess commissioned a large egg from Faberge. She was the only American to commission a large egg from them. It is believed to have cost over 5000 rubles. This beautiful ornament, a clock in the shape of an Easter egg, was crafted by Michael Perchin, who was inspired by a Louis XVI clock. The egg is coloured in translucent pink, white and gold with a diamond-encrusted serpent surrounding it. It features the diamond-set monogram of Consuelo - the initials CM under a ducal crown. After her divorce from the Duke Consuelo gave this to a charity auction in 1926 where it was bought by the Polish soprano, Ganna Walska. This was the first Faberge Easter egg that Malcolm Forbes bought. In 2004 it was sold to Vekselberg. Like Jordan, I only found out the meaning of this term recently! I love the Victorian/ Edwardian eras so I'm a big fan. Read her post which explains steampunk here:What is steampunk? What is your current obsession? Sarah and John Churchill. I'm in love with the ravishing Duke of Marlborough, the victor of Blenheim. Sarah is almost more interesting. It's a great love story. Good fika place? Not sure about this one. Do you nap a lot? No-not a napper at all. Who was the last person you hugged? My husband. What’s for dinner? Lean pork chop, mashed potatoes and spinach. What was the last thing you bought? Writing Magazine at the newsagent. What are you listening to right now? The Duchess by Amanda Foreman. What’s on your bedside table? Books-I just love them. Say something to the person/s who tagged you. She didn't tag me, but Histatic is a wonderful blog! If you could have a house totally paid for, fully furnished anywhere in the world, where would you want it to be? I would have to say the Italian lakes. George Clooney can't be wrong. Stresa is the most beautiful town. Favourite holiday (sorry) spot? The Italian lakes again. I'd love to go back to Belgirate on Lake Maggiore. Name the things you can’t live without. I can not live without my husband, my close family and friends and my books. What would you like to have in your hands right now? The book that I'm expecting about Anna Pavlova!. What is your favourite tea flavour? At the risk of being boring, Twining's English Breakfast Tea. Yes, it has to be Twinings! Which modern Royal would you most like to meet? Princess Mary. I like her grace and elegance. I also like her because she's Australian and has a Law degree. If you could go anywhere in the world for the next hour, where would you go? Lake Louise in Canada. I went there when I was 11. We had lunch at the beautiful old hotel on the lake and walked in the garden. It was wonderful and I'd love to spend more time there. What did you want to become as a child? I wanted one career after another! They included: actress, writer, English professor, teacher, botanist.. I'm what Barbara Sher calls a 'scanner'. What do you miss? I agree with Histatic here: University-it was awesome. I miss doing my Arts degree. What are you reading right now? I am about to read Becoming Queen, Kate Williams. What designer piece of clothing would you most like to own (new or vintage)? A Poiret gown. If you could go back in time what period and where would you go to and why? (question added by TammiMagee of Histatic!) At the minute I would go to the mid to late 18th century in order to meet Sarah Churchill and Abigail Masham. Last question, added by Sallymandy: How do you feel about the economy? I hope that it's looking up! That’s all for me. If you’d like to do the meme, here’s how it works. This Antarctic hero famously almost lost his life searching for the eggs of the Emperor Penguin hoping that they'd help solve a Darwinian problem. A son of an aristocratic family who eventually inherited two English estates, Cherry-Garrard could have become a country gentleman and squire. He didn't need to work, but he was looking for more meaning in his life. He met Edward Wilson who became his mentor and helped him win a place on Scott's last expedition. 'Cherry' wrote his great classic, The Worst Journey in the World, about his harrowing time in Antarctica. This biography describes Cherry's great expedition and experiences at the Antarctic, deals in depth with his terrible struggles with depression and his mistreatment by the Press and the British Museum, and his happy marriage at the end of his life. Wheeler also made an expedition to the Antarctic and her anecdotes make this part of the book very interesting. The problem is that the book fell away a bit after the account of the Antarctic journey, because this was the most fascinating part of Cherry's life. It also became quite harrowing because Cherry was haunted by wondering whether he could have saved Scott and this affected his life badly. However, it's well-worth reading if you like to read about Antarctic heroes. My article: Couturier Paul Poiret won an Editor's Choice award! Recently a large pink Faberge egg sold for $18 million at a Christie’s auction, setting a record for Faberge eggs. The new owners of the brand, Pallinghurst, Inc. are no doubt, extremely pleased with this price. They hope to restore the company’s illustrious reputation which was tarnished during the seventies by some bad choices of perfumes and tacky diamond-encrusted jeans! Already Faberge sales of the famous clocks and jewelry have increased greatly. The new owners have the family’s approval and Pallinghurst, Inc. has appointed Tatiana and Sarah Faberge, the founder’s great-great granddaughters as advisors. The famous Russian firm was begun by Gustav Faberge, a goldsmith, who immigrated to the country from France when Peter 1 invited goldsmiths, artists, and other skilled people to St.Petersburg. The Tsar wanted to make the city into a center for the arts and his ‘window to the West’. It was Gustav’s son, Peter, who really founded the company’s fine reputation, however. 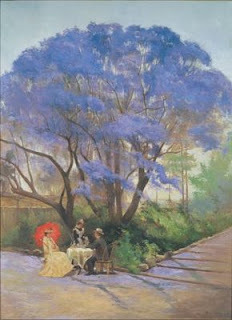 He studied his art in Florence, London, and Paris, after completing his craftsman’s apprenticeship at a young age. When he returned to Russia he became friendly with the treasurer of the Winter Palace and started copying some of the collections there. Assisted by his brother, Agathon, who was a brilliant designer, he gradually became famous for his unusual techniques and craftsmanship. Faberge used brightly colored enamelling, gold and silver, precious stones and cabochons. Peter Carl Faberge was so meticulous about the quality of the firm’s work that he smashed any piece that wasn’t up to his standards with a hammer! Tsar Alexander III noticed copies of ancient jewelry made by the brothers at an exhibition and he was very impressed. Faberge soon became the Imperial goldsmith and silversmith, which increased its reputation greatly. I soon became the largest business of its type in Russia. The Imperial family began the tradition of giving Faberge eggs as gifts at Easter in the same year (1885). The Tsar commissioned the family to create an egg for his wife, Tsarina Maria Feodorovna. Known as the ‘Hen Egg’ this had plain white enameling and a gold yolk holding a golden hen. They continued the tradition until 1916. Other famous clients included the British royal family, Consuelo Vanderbilt, and the Rothschild’s. King Edward VII commissioned a miniature zoo for his beautiful wife, Alexandra. The Russian Revolution led to the company’s sad decline. Some of the family attempted to continue their fine work from France but in 1951 an American corporation acquired the rights to the brand for only $25,000.00. The family couldn’t afford the expensive litigation required to retain the rights. This is a grim and very sad story of great courage and sacrifice told movingly and sympathetically by David Crane. Recent historians have given Scott's reputation a beating and Crane restores it very well in this excellent book. 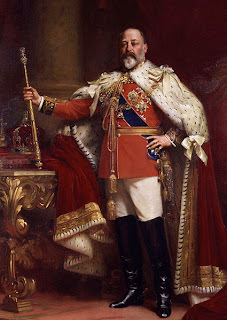 He argues that all of the qualities that made Scott so beloved by Edwardians - honour, loyalty, patriotism, sacrifice - are the very characteristics which have made him reviled today. After reading this book I wonder that anyone dared to criticise Captain Scott. As Sir Ranulf Fiennes wrote: "No previous Scott biographer has manhauled a heavy sledgeload through the great crevasse fields of the Beardmore Glacier, explored icefields never seen by a man or walked a thousand miles on poisoned feet. To write about hell, it helps if you have been there." Scott coped with enormous difficulties - the deaths of some of his men, the loss of dogs and ponies, crevasses, manhauling heavy loads, terrible winds. The list goes on and on. In the end it was really only the unusually cold weather that defeated his team, according to Crane. Scott's leadership has been criticised and he did have flaws. He could easily get irritable and he didn't like any lowering of standards, but his men (except for Shackleton) said that they'd follow him to the ends of the earth. As indeed they did. The sentence that summed up the character of this complicated naval officer, who was unhappily beaten to the South Pole by Amundsen, for me was: "In his journal Bowers noted that Scott gave himself a longer trace on his harness when they were pulling through the worst of the crevassed areas, so that if anyone went down it would be him." I defy anyone to read these without being moved to tears. "Had we lived, I should have had a tale to tell of the hardihood, endurance and courage of my companions which would have stirred the heart of every Englishman. These rough notes and our dead bodies must tell the tale, but surely, surely, a great rich country like ours will see that those who are dependent on us are properly provided for." I can't find this and I hate losing things, especially books, so it's really upsetting me! I'll write a little bit about it from memory, but I like to have the book beside me when I review it. I'll write more when I find it. This was the sort of book that I really like. Kathleen really had a more interesting life than her admirable husband! She lived life at a breakneck speed and Young, her grand-daughter writes in a breathless style which suits it. A Bohemian young sculptor who 'gallivanted around Europe' and loved to sleep outside, Kathleen didn't meet Scott until she was 28 and he was over 40. Before this she studied art in Paris where she met Rodin and attracted flocks of men (as she seemed to all of her life), went to Macedonia to help war-victims and backpacked in Greece and Italy. She also met the famous dancer, Isadora Duncan, and stayed with her when she had her baby. Isadora was in love with a 'cad' and was still single. This was rather shocking in those days but Kathleen didn't care. She became famous herself after she married Scott, gaining commissions from people such as Lloyd George and George Bernard Shaw. 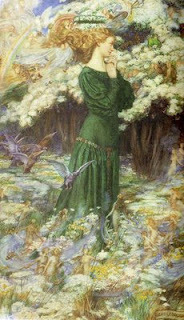 She associated with the aristocracy and artists. Kathleen became rather an intimidating figure as she got older, apparently, although liked by many. Her daughter-in-law, the novelist, Elizabeth Jane Howard, married Kathleen's son, Peter, and found Kathleen difficut to cope with. Only 17 when they married, she felt that she couldn't live up to the success of this eminent family. Kathleen's reputation has been blackened like her husband's. She's been accused of having an affair with the explorer, Nanssen, while Scott was suffering in the wilds of Antarctica; deserting Duncan when she took to drink; and various other things. Young restores her name in this book, correcting these misconceptions. This is very much worth reading if you are interested in the Edwardian age, the English aristocracy, or just a good biography. 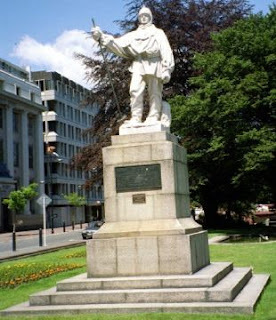 I first went to beautiful Christchurch, NZ, four years ago and saw Kathleen Scott's sculpture of Captain Scott near the cathedral. When I came back I looked her up on the internet and found out more about her. I meant to read this book then but I didn't do it until I came back from NZ last year! She deserves to be famous once again so I hope that this blog will make more people aware of her. London 1904 On Film was made to show Australians what life in London was like in 1904! I haven't seen it yet because watching these movies takes up so much bandwidth but I'm looking forward to it! Course Hero is a social networking site which provides a way for college students and tutors to interact. It is a relatively new idea that gives students access to many different textbooks and enables them to form study groups. There are over 200,000 textbook solutions at Course Hero. These range from books on calculus to texts on management. Two examples are Virginia Tech Textbook Answer and Accounting Textbook Answers. There are also final lecture guides, examples of answers to exam questions, and notes on homework. Course Hero also provides a way for students to form study groups. They can ask each other questions, help each other with resources, and provide fellow students with support while studying for exams and assignments. Students can find fellow students, professors and obtain resources easily at Course Hero Signing up is free and easily done through Coursehero’s Facebook page. Basic membership is free. This clever idea will definitely help college students to get ‘A’ grades!